Keeping the toilets in your home clog-free and efficiently is important. 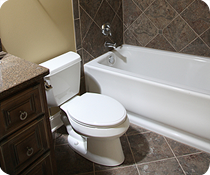 AVS Plumbing & Heating has provided the residents of Howard and Carroll Counties in Maryland with qualtiy toilet installation and repair since 1954. Toilets that do not operate at their best can cause costly water damage. To ensure that your toilets are operating at their best, check the tank and seals around the wall and floor every 6 months. Signs that your toilet is in need of maintenance includes dripping or gergling sounds in the tank, wetness around seals or on floor near installation sites, discoloration of bowl due to rusted parts, slow draining or filling or frequent clogs. 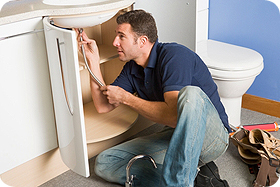 When your toilets are in need of service, trust the professionals at AVS Pluming & Heating. We carry quality plumbing products in stock, and provide service to a wide range of plumbing products on the market. Gerber is among the premier names in plumbing products in the US. For the past 75 years, Gerber has made it their mission to develop and manufacture the best plumbing products in the industry. AVS Plumbing & Heating is pleased to stock Gerber toilets, and we recommend them to our customers because of their quality and efficiency. Gerber products are designed and manufactured in the U.S., Canada and Asia and are sold through wholesale distributors in all 50 U.S. states and Canada through their four distribution centers in North America. Gerber is a proud member of the U.S Green Building Council, and an active partner with the U.S. EPA’s successful WaterSense program. n addition to our Gerber toilet product line, AVS Plumbing & Heating can service and install toilets manufactured by top names such as Toto, Mansfield, Crane and Eljer. If you need service on your bathroom toilet, contact the experts at AVS.